Disaster struck whilst making my first colour work hat, which is why it's taken me a while to update you all on my progress. 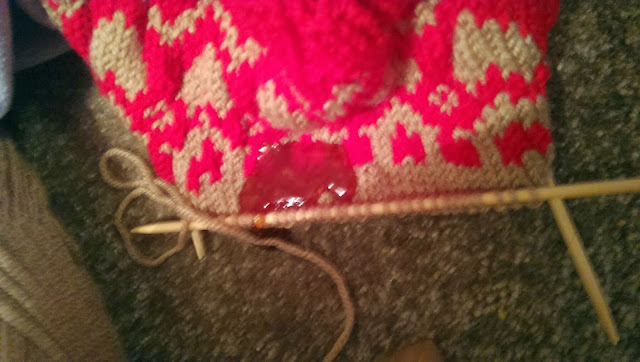 A puddle of the stickiest sweet chilli sauce ever... on my hat! As you can imagine, I wasn't very happy about the whole situation, and was a bit stuck with what to do. I tried to google, but apparently there isn't a lot of information about what to do if you spill something on your hand knits mid project! In the end, I mopped up as much of the sauce as I could, and then held the hat with kitchen roll while I continued to knit it. After a while I was holding clean yarn, instead of kitchen roll over sticky yarn, and a couple of days later I finished the knitting. I then cleaned the finished hat in lukewarm water to get rid of the stickiness and I was thankful that the sauce didn't stain or discolour the yarn. The hat took a good few days to dry in our chilly house, but I've finally managed to get a few pictures of the finished item, and can now start wearing it! I'll be making another from the same pattern, in different colours, at some point soon, which will be for my Mum. And from now on... no more leaving my projects on the floor!